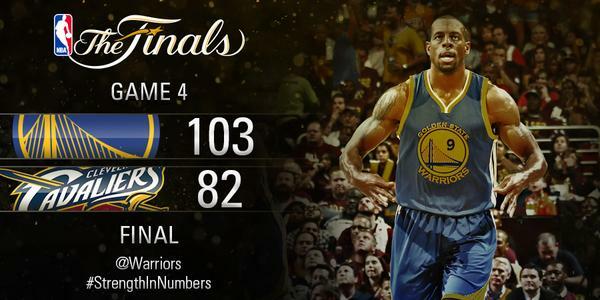 Check out on this page the NBA Finals Game 4 results, highlights and analysis. MANILA, Philippines – After some adjustments from NBA Finals Games 2 and 3 debacle, Stephen Curry finally repulsed Cavaliers’ emerging hero Matthew Dellavedova’s sticky defense to cop game 4, 103-82 and tied the series 2-2 at The Quicken Loans Arena in Cleveland Ohio, USA on June 12, 2015 (Manila Time). With just 2 minutes gone by after the opening tipoff, Golden State Warriors Head Coach Steve Kerr immediately called a timeout as his wards missed 4 consecutive shots while the Cleveland Cavaliers blasted a 7-0 run courtesy of Tristan Thompson, Timofey Mozgov and an early trey from Iman Shumpert. After the timeout, the Warriors fired back with quick 8 points from a baseline jumper from Harrison Barnes and a three-pointer from Stephen Curry followed by another successful attempt on the 6-minute mark. Curry and the Warriors were really looking eager to bounce back from 2-straight losses. It was Coach David Blatt’s turn to call a ceasefire after the Warriors took the lead, 22-20 with 3 more minutes remaining in the opening salvo. Good start for the Warriors as they lead the Cavs after 12 minutes of fast-phased basketball action, 31-24. Both teams started the 2nd quarter with their respective star players on the bench. Leandro Barbosa and Shaun Livingston maintained their margin while the splash brothers took a breather as an award for their hot start. 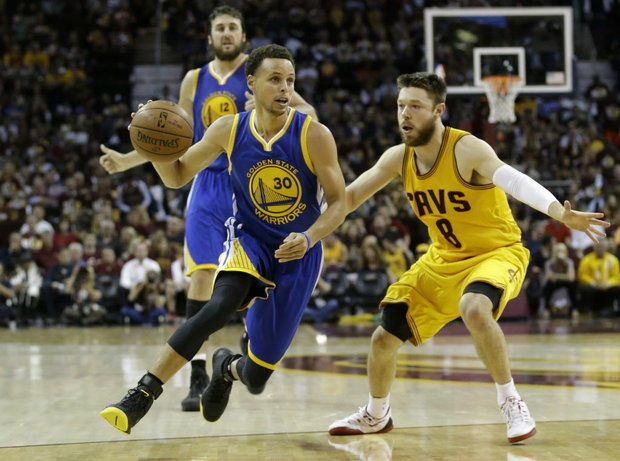 In contrast to games 2 and 3, Curry has repelled Dellavedova’s defense with 2 three-pointers in the first quarter alone. Off-night at the downtown area struck Cleveland, shooting only 2/13. The Cavs were shooting blank from the 3-point lane while the Warriors finally found their rhythm and imposed their biggest lead of 15 points with 4 minutes remaining before the half time break. The whole stadium was on shock when Lebron James drove hard to the basket but got fouled by Andrew Bogut. Lebron hit the deck hard and smashed his head on one of the cameras. Blood started to flow from James’ head and was immediately attended by the Cleveland medical staff. Lebron stood-up and went straight to the foul line careless of his bleeding head cuts. Golden State headed to the dugout with a double-digit, 54-42 lead. Warriors’ hot hands continued to sizzle in the third quarter. Andre Iguodala sank a three but Matt Dellavedova countered it with his own version and back-to-back treys. Surprisingly, Lebron James wasn’t attacking the rim like he used to. Instead, steadily locating his teammates for open shots and mismatches that brought the lead down to only 3 points under 5 minutes of quarter number 3 for a 12-2 scoring run. The Cavaliers were slowly but surely cutting down the lead. 76-70 after the penultimate quarter. Just like that, the Warriors regained their double-digit lead, 80-70 on the opening of the final period which prompted Coach David Blatt to bring back Lebron James in. Andre Iguodala who’s consistent in superb scoring performance in the series helped the Warriors sealed the game with 22 big points plus Stephen Curry’s 22 identical markers. Cleveland’s worn out. The Cavaliers are suffering fatigue due to lack of bench support. Golden State on the other hand, utilized its deep second unit to keep its players fresh in 4 quarters. Lebron James’ experiment of laying low in the first 3 quarters fired back. Collapsing in the final period has becoming a bad habit for Cleveland. For the first 3 games, they were all out in the first 3 quarters to secure a big and comfortable lead. But, they always melt down in the end game due to low energy which they exerted in the early quarters. Cavs made an adjustment on sustaining their energy and reserving it for the final period. But it didn’t work that way. Iman Shumpert – JR Smith combination is a missing link in game 4. Ex-Knicks only made 9 points combined. Now that the series is tied 2-2, we have a brand new series. It’s considered as 0-0. Game 5 winner will bring a big impact and confidence heading to game number 6.